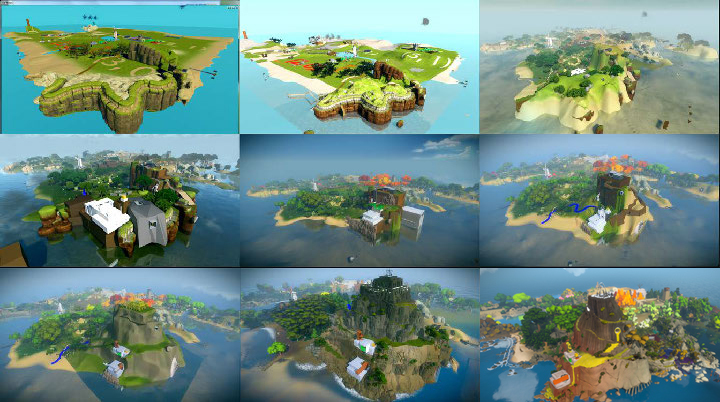 Figure 1: The Witness Island at the time of game publishing. (Thekla, 2014). Figure 2: Evolution of the Island through time. (Fletcher Studio/Thekla, 2010-2014). You wake up in a dark circular cave and walk up to a door. With a series of simple gestures, you solve a puzzle and gain access to the Witness Island. Your avatar is now free to explore the island, in an open world environment. The world is familiar, but a bit off kilter. It is rendered in bright hues, dappled and almost pointillist. You hear the sounds of nature, birds, wind, and running water and your own footsteps. You move through ruins, modern adaptations of ancient buildings, and through diverse landscapes. One minute you are in a scarlet red autumn forest, the next you are in snow atop a volcanic cinder cone. You are in a place of wonder. As a video game, The Witness is an intellectually challenging work of art. It is an adventure puzzle, set on a complex and mysterious abandoned island, populated with a multitude of biomes, geologies, cultures, and seasons. It expresses the overlaid palimpsests of fictional civilizations that have been planned and designed using the media of time and entropy. There are no guns. There is no high score. You are not competing with anyone. It is simply you and your brain solving puzzles, exploring a fictional world with a larger narrative that unfolds, as you progress. The Witness was conceived of by independent developer Jonathan Blow, who wanted to create a game that would encourage users to become sensitive to their environment and to achieve a sense of accomplishment and enlightenment. Having a rich and engaging environment was crucial to game play and in 2008, Johnathan approached Fletcher Studio to help develop a geographical and spatio-temporal framework for the various teams to work within. Our studio worked full-time for three of the game’s seven years of development, designing and modeling spaces, structures, geography, geology, environmental puzzles, and biomes. The design of the Island requires thinking across scales, both spatial and temporal. It also blends the rigors of science with artistic expression. It is a task for which Landscape Architecture is specially qualified. For clarity, I will refer to the Theckla team as the game development team and the architecture/ landscape architecture team as the design team. The Thekla team was partly made up of programmers, who were working on the technical practicalities of the game engine, the game coding, and user interface. This team also included talented illustrators, programmers, and modelers. Jonathan is the ultimate producer and art director of the Witness. In order to understand the planning and design of the Witness’ Island, it is important to understand the mechanics of gameplay. It should be noted that there are greater meanings and stories that unfold as the game progresses, which will not be disclosed in this writing. Gameplay progresses as you solve approximately 650 maze based puzzles, each with their own mechanics and symbols. The game takes between of 60 to 80 hours to complete. Solutions are learned through environmental clues, prior puzzle solutions, and through listening to audio recordings found in the environment. The game requires and inspires heightened perception, balancing game play with environmental sensitivity. Reviewer Chloi Rad described it best: “The Witness does more than equip you with the tools needed to find the right answers – it teaches you how to ask the right questions”. Unlike other games, a sense of accomplishment is not rewarded with points, tokens, or “achievements”. “I feel like unearned rewards are false and meaningless, yet so many people spend their lives chasing [them],” Johnathan states in an early interview on topics of progression incentives[i]. The many epiphanies offered in the Witness are motivation enough. Jonathan was also committed to creating a world that was quiet, without visual clutter, where every object has a purpose and where everything was interconnected. The Island is separated into roughly 19 surface areas and an undisclosed number of subterranean spaces. The puzzles are maze based, and are mostly located on flat panels which vary in material, transparency, and technology. The player simply solves them by drawing within the maze presented on the panels. A given area may contain puzzle arrays (a bank of connected puzzles) and puzzle groups (separate, but in the same area). All must be solved in sequence, and which become progressively more challenging. When a puzzle group is solved, a turret emerges from a box and projects a white beam to the top of a mountain. Seven of these beams need to be focused on the mountain, in order to gain access to the underworld in which the “Endgame” exists. Clues to puzzle group solutions are often hidden in the environment, and can be discovered through body positioning and careful anamorphic alignment, relative to natural and manmade objects. From a certain vantage point, a tree or rock formation might geometrically convey the symbolic language, to solve a given puzzle group. Certain arrays and groups also serve to teach the mechanics and the symbolic language needed to solve future puzzle. They might also trigger access to hidden areas. Also embedded in the environment are hidden 3D illusions, which are known in the industry as “easter eggs”. These illusions were sometimes tied to puzzles, but more often they relate to the greater game narrative. Often anamorphic, they require one to position oneself just so, and a figure or symbol is revealed. Jonathan’s team worked for first three years, coding their own streamlined game engine. During that time, they developed concept puzzles, rudimentary structures, and a rough island form. He hired on Fletcher Studio and Fourm Design Studio, to create and enrich that world. During this initial period, most of the development team’s time was spent in refining their game engine, and in further developing puzzles, which were continuously added to the Island. Buildings and spaces were placeholders, which had only enough development to support basic gameplay and testing. Aesthetics, and geographical rules were not important. From the beginning, we perceived the island as a fundamental tourist experience. We sought out to create an engaging, beautiful, strange, and memorable experience for the player, independent of the gameplay experience. The experience of the island should be one enriched by wonder, even if one never solve a single puzzle. Designing environments for video games should be a relatively easy undertaking. You are given a context, as theme, a genre. “You are designing a first person shooter, in an abandonded Russian research laboratory on Mars…”. For that scedario, one might already know what the constraints may be, what it may look like, what materials we might use, what the feeling and atmosphere may be. Unlike Mars, the Witness Island began as a green blob, with 8 randomly placed test puzzles and structures that included a windmill, towers, a forest and a few docks. Many of the familiar considerations that might guide a designer’s work were nonexistent. Cultural history, climate, ecology, geology, boundaries, spaces, buildings, boundaries, rule-sets, and constraints had to be created from scratch. We first set out to reverse engineer the Island, as it might have existed before civilization. Hundreds of Islands were identified and studied, in the search for small, temperate islands that have a rich history of isolated civilizations. Known as Europe’s secret Islands, the Archipelago of the Azores offered the most material to work with. The layers of different cultures, from ancient civilizations to the Portuguese monarchy, to present day fishing villages, proved most analogous. Available aerial imagery was collected from the Azores and then collaged together to create a fictional Island in plan, now with topography, beaches, water bodies, etc. Figure 4: Puzzle group tied to environmental cues (Fletcher Studio, 2012). Figure 4: Aerial collage and early geology and landscape studies (Fletcher Studio, 2011). Figure 5: Geology. (Fletcher Studio, 2011). We also wrote an environmental narrative for the Island, which formed the basis for design in subsequent phases. Through determination of solar orientation and dominant winds, the studio was able to establish the crucial gradients of wet and dry, windward and leeward. We then diagrammed the underlying geology, establishing assumptions regarding rock types, soils and substrates. The resultant mash-up of granite, basalt cinder cones, limestone and loose sandstones were located in specific zones and guided building materiality, soil types, and subsequent biomes. Using these fundamental climate and geological assumptions, we began to develop a set of simple ecological rules that established the make-up of the Island’s ecologies, and their bordering ecotones. With the Island geography adopted, both the development team and the design team had an agreed common context, into which emerging puzzle groups could be placed. The development team had conceived of a few existing buildings and their associated spaces that needed to be “designed”. The design team needed to provide these immediate design services, while also addressing the new structures and spaces that were appearing rapidly and randomly. Spaces no longer needed to be built around existing puzzle groups; rather, puzzle groups could be sorted and located in areas with which they were geographically compatible. Certain puzzles might need to located in a forest, others might require bright sun or water reflections to be solved. In the same sense that the geographical context had to be created and adopted, the design team had to invent a cultural mythology for the Island. Production on the game began after the 2008 economic meltdown. At that time, our office had few billable projects project. To intellectually supplement this work, we entered into “ideas competitions” and explored the world of academic exhibition based practice. The research that was conducted during this period helped us learn and develop methods that later proved invaluable to our work on the Witness. At the time, we were drawn to competitions that required both large and small scale planning and design solutions, set in near and at times far off futures. The design challenges we found most interesting also related to emerging economic and environmental anxieties: competition titles such as “Out of Water”, “A New Infrastructure”, and “WPA 2.0”. [i]Planning for the future of Los Angeles regional infrastructures in the year 2125 required the development of projective temporal matrices. The ‘future’, needed to be subdivided into 25 year time increments. Assumptions about the future, and also about societal or technological responses, needed to be plugged into the matrix in order to provide a projective succession, for the future of the megaregion. The Witness Island was not about the future, but about the past and present. Game critic Ian Bogost calls the game player “"the archaeologist of the lost civilization, that is a game’s creator. "[ii]The player moves through environments and they piece together their own narrative of the civilizations who might have inhabited them. In the beginning, the island was a cultural tabula rasa. In order to make sense of the existing and constantly introduced structures and spaces, it’s cultural history had to be written. The projective devices that we had developed, were applied to the Island in reverse. The past was divided into three successive epochs, which we termed Civilizations (CIV’s) One, Two and Three. A simple description of each was developed, and then a larger matrix, was produced that related to each in terms of infrastructure, architecture, and landscape. Each of these three categories had their technologies, agriculture, religion, and cultures. Materially, each epoch had its own techniques of building, based on assigned resources and technologies, with each CIV methodologies and products growing more refined over time. 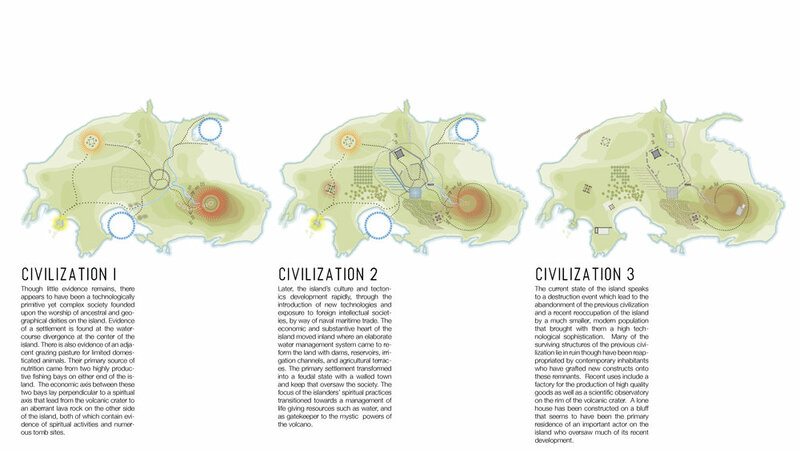 Figure 6: Three fictional civilizations (Fletcher Studio, 2011). Existing and emerging structures, spaces, and puzzle groups could now be plugged into spatio-temporal context. The Windmill, for example, served gameplay as a kinetic puzzle, but was perplexing in terms of cultural or geographical logic. This structure, and ones like it, could now be placed in time, and be subject to that times governing rule-sets. In out narrative, the Windmill began as a CIV One sacred mound, whose rock was reused to construct the foundation for a watchtower in CIV Two. Civilization Three then adapted the tower, as a means to pump freshwater from the reservoir to the rest of the island. Often, once a structure had been given meaning, it then inspired the addition of other landscapes and infrastructures. The existence of the Windmill necessitated the addition of a lake, a small stream, and eventually a dam and a logging flume. There was a growing reciprocity between the gameplay, architecture and landscape with the island environment and story. For example, the use of a given building material, lead to the creation of a logged forest, a rock quarry, a glass factory. Puzzles were added to support the resource extraction and manufacturing narrative: A shipping freighter was added to justify the use of steel on the island. This ship was perhaps the source of something that not be easily made on the island, and much of it’s iron had been harvested, and can be seen in various states of reuse throughout. The island became increasing more complex and required a great deal of physical, invisible, and behavioral analysis to understand the multitudes of structures, ecologies, and puzzles, and their interconnectivity. The programmers also employed many constraints to control and limit circulation. Visible objects (structures, terrain, rocks, etc.) are, in game play, solid. Edges of water, cliff faces, must have invisible barriers, termed collision maps, which keep the player from walking out into the ocean or falling to their peril. Within those barriers, one is free to roam within a given area. Three tiers of complexity emerged, that needed to be addressed in order to understand and design the landscapes for the puzzle fields. The first and simplest design challenge was in how to locate and design for the puzzle arrays. A certain array needs to be positioned in a logical place or conversely, hidden from view. Often though, the solution is tied to something else, in the environment. The limbs of an apple tree or the pattern of its apples, from the vantage point, may reveal a solution. In the second, separate puzzles or ‘puzzle groups’ might be physically connected with wires, cables, or with environmental effects such as light and shadow. In the third tier, whole puzzle arrays and groups were connected to each other or to other structures, such as the beams that all concentrate on the mountain. In short, a single puzzle may be symbolically or mathematically tied to objects within its space while also being interconnected with other puzzles. The design team had to learn the mechanics of the puzzle groups, how they worked, how they interrelated. They also would need to anticipate player behavior, in order to improve clarity and to minimize frustration. The programmers often used algorithms, to record, anticipate and analyze user behavior. The design team had to use diagramming, modeling, and sketching to sort out this complex, invisible, and everchanging network of connections. With an understanding of puzzle mechanics, and with the planning and geographical framework in place, the hard work of designing the individual spaces began. The space around every building and structure needed to be designed, either as a present day, historic or retrofitted space. At the height of development, the team was designing over 70 simultaneous “projects”, and also receiving new structures and areas on a weekly basis. Each project had a series of reviews, and each had deadlines. Initially, projects were worked on iteratively and were tracked through architectural phasing, conceptual design through to design development. Though helpful at the beginning, the sheer number of projects, and their interdependence made this working model impossible. During the final year of planning and design, our team was sharing images and 2-D design proposals online, and also working directly in the game engine, placing models and making adjustments. At the height of production, our offices collaborated on dedicated and networked computers in realtime. Often, we would create on three alternative models for a space, which we would park in the ocean. The development team would then test them in the island and evaluate them relative to gameplay. Figure 7: Temporal Matrix: Architecture (Fletcher Studio/ Fourm Studio, 2011). Sorting through the multitudes of project types became a live mapping exercise. Each structure and space was sorted into a typology, assigned an icon, and were then plugged into the CIV temporal matrix. Newly created buildings and puzzle areas would be placed in appropriate geographical and ecological context. They would then be run through the matrix, to fix assumptions as to how it has evolved, what purpose it serves, it’s aesthetic, materials, etc. As noted previously, at times new landscapes were created for new structures, or to support narratives relative to resource extraction and materiality. 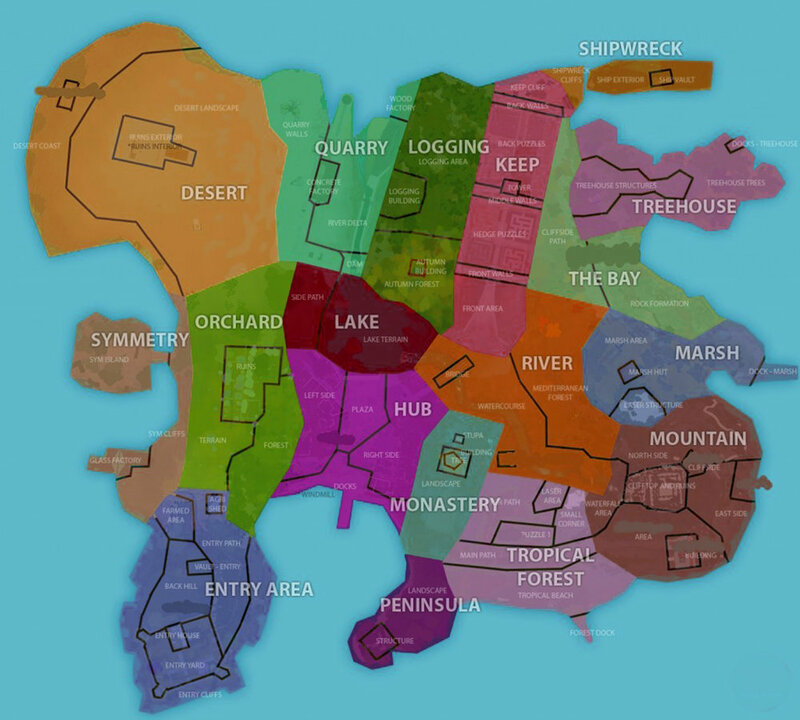 Maps were then presented to the development team that allowed different associations to be tested relative to gameplay. The design team worked simultaneously at many different scales. On a given day, the design team might be working on detailing an ornamental gate for a hidden map room, modeling complex ritual stairs and perimeter walls for a Temple, and designing a desert. Each would typically have two to three alternatives for review. Initial site design occurred as would be expected, concept images were collected to support analog drawings and studies. Often overlay perspetives were used to convey complex ideas. Gameplay diagrams were created to help ensure that the proposed design did not “break” puzzle. One a concept was approved, it was modeled in Rhino and alternatives were developed. Certain design challenges required pragmatic problem solving such as grading, access, containment, ornament, etc. The design team would work on rock arrangements, pits, ridges, and other landforms to support the immediate needs of gameplay. Other design challenges were more conceptual in nature, and would require a great deal of precedent research to build up a compelling and complete concept. In spatial conceptual development, our studio had free rein to invent new spaces, to incorporate references to some of our favorite landscapes, natural, manmade, and infrastructural. The only rules were that everything had to have a purpose, spaces had to work with gameplay, and that there could be ‘no circles’. Circles, in the Witness have both a universal symbolism, but also are geometrically tied to gameplay. It is not only the shape used to solve puzzles, it’s use in the island is always signifies gameplay. To that end, there are no round rocks, even stumps and the ends of logs are misshapen. There were some spaces that were impossible to design, too open ended. These did not fit neatly often into the matrix, or were where gameplay demanded random walls or subdivided gardens. In these areas, we employed entropic design techniques. Whole defensive buildings, with ramparts and whole towns were designed, developed and then destroyed to provide armatures for puzzle spaces. What may at times look like random garden walls can be, from a distance, understood as the walls and foundations of ancient civilizations. Eventually, all of the landscapes and spaces had been roughed in and the final six months of our work involved constantly refining and clarifying them. Key perspectival points chosen. These were often at important symbolic moments, or at thresholds between one puzzle space and another. These views also needed to be carefully composed in order to clearly show a symbolic subject, but also to mask or screen out parts of other puzzles, hidden paths, etc. In this way, the exercise was not unlike Repton’s picturesque visualization techniques. We would prepare boards that include a current screenshot of the area in question, and then would reference its biome and geology type. We would then prepare collage, that express vegetation character and materials, and plant massing. Often, anomalies and exceptions were often deliberately added to subtly influence behavior. A strangely shaped stone or plant, might be placed in a certain location, to encourage a player to desire one path over another, or draw them to an area in order to view a symbolically significant object. Near the entry, for example, a red bush was placed so that the player would be drawn towards a knoll. From that view, framed with stone, the player sees the Mountain, which represents the “End” and more specifically death. The development team modelers would then create plant palettes to match the scenes. Each scene would go through a few iterations, and be constantly evaluated in the shared master model. After a time, the design team would make refinements within the model. We filled the Witness with our favorite landscapes. Often, these were pulled from personal experience or to celebrate cherished landscapes and habitats. The game has heather fields, orchards, an invasive weed garden, deciduous forests, flower gardens, a tropical rainforest, cypress groves, dwarf manzanita, brutally pollarded sycamores, swamps, pine forests, palm groves, a bamboo forest, and one ancient and sacred fig tree. Concepts were borrowed from landscape ecology, and simple systematic thinking was applied to each with special sensitivity to how they might interact. With so many different landscape types, it was critical to develop simple rules that govern how the edges overlap and interact. One or two dominant species from one landscape can be seen overlapping another, to soften transitions and blend them. The plant materials was modeled and placed by the development team, with adjustments by the design team. Field guides to each landscape type, such as the ecological stratification of the jungle, were provided to them to help them understand the hidden rules that determine the landscape structure. A typical game might cycle through many different environments, or variations upon a theme. To my knowledge, no game has so many interrelated and diverse spaces, into one area, simultaneously. For this reason, my thought is that the Witness is a one off. I do not think we will ever work on another video game; rather, I do not expect that such a comlpex challenge will present itself again. The game was published in January of 2016, to resounding critical[i]and commercial success. Theckla broke even, on their 6 million dollar investment, during the first week of sales. During that time, more individuals and groups explored landscapes and spaces (legally or illegally) that we designed, than will ever explore our built landscapes in my lifetime.